Just the item that any Card Captor Sakura/Cardcaptors fan needs. "Kon-na-nichiwa!! Are you reading every month? Please read!! It's time for "Leave it to Kero," the more-than-likely, one-time program full of information about Sakura, coming at you from Animefringe! I wonder what's up today... Oh, a piece of Cardcaptors merchandise!" You've probably seen the six Cardcaptor fashion dolls, talking Kero plus, and the beanie Kero by now. But, the only real piece of merchandise that stands out from the rest of the crowd in originality is the Official Clow Book with Clow Cards box set. The thing that made me just have to lay down my ten bucks for this set was the awesome nature of the box it comes in. The wide windowed box has the Clow Book on the right and then 4 cards spread out beside it on the left. The box obviously matches the red on purple scheme that all the other Cardcaptors merchandise uses, but also has the original Japanese logo in several places just like the recent Sailor Moon merchandise. Once the book is out of the package all I had to do was put the four cards in the book and the item was complete. Best of all there are no parts to lose because this book can be displayed just about anywhere and stands up by itself. The Clow Book is made up of hard plastic with a wrap-around red cover featuring molded edge designs giving it an ‘ancient' feel. 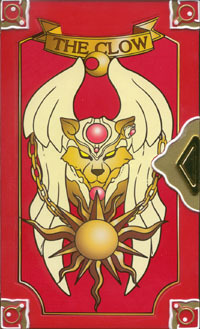 The famous Guardian Beast cover, Clow Card design on the back cover, and ‘The Clow' spine label are pasted on by way of full size stickers that come pre-pasted for a near perfect fit. I would recommend taking a soft rag and pressing down over the sticker just to make sure it is firmly down and without air bubbles though, just to be on the safe side. Holding the book closed is a red nylon strap with plastic hook. Once this is removed the plastic cover can be opened reviling yet another full size sticker on the inside cover and a hard white plastic tray that gives fits the Clow Cards perfectly. I find that it is nearly impossible to take all 52 cards from the book in one try. In fact the fit is so perfect that it takes me nearly four tries just to get all the cards out without damaging them. So how do they stand up to wear and tear? Well, all 52 cards are made from slick card stock and they fit perfectly as a set in the Clow Book, but are sturdy enough to stand up to a slightly overactive kid ready to portray Sakura on a quest to recapture the Clow Cards. But, if putting the cards in plastic is your thing, then you may have a problem because these cards are the size of Tarot Cards. But, these babies will go great along side the Escaflowne and Sol Bianca Tarot Card sets if you want to figure out a way to display them in a book. A quick run through off all the cards gave me a sense of power. But, it also left me realising something about how some of the designs for the cards are a little vague at times. While most cards can be easily identified by looking at the picture, some cards are much harder to guess, for instance: The Sand which sports a floating lady and The Big which has a woman fully decked out in waving cloths. At other times I found myself wondering how certain cards designs had been switched or not like how The Snow card just has a dark image of a woman standing in a kimono, while The Mist card has a lady with circles around her. But, for anyone how reads the manga or watches the show, it's easy to figure out just how these cards are used by the characters giving an amazing degree of freedom for kids who still have enough imagination left to have an adventure to as a Cardcaptor. The only real downside to seeing these cards put out on the market would be for some radical religious organization to condone them and Cardcaptors as being satanic because they contain magic or whatever excuse they came up with for the Pokemon card game. For that line of thought I just have three words: "get a life." When put up against the six Cardcaptors dolls, this item's quality shines through. Now all you need to make this book ultra-cool is to put the beanie Kero-chan plush right beside it. Just make sure he doesn't fall asleep this time. "Anyway, that's it for this review. I think the Cardcaptors merchandise is really starting to shine and hope your looking out for it. You should keep your eyes peeled for all the new stuff that will appear in the future! See ya!"